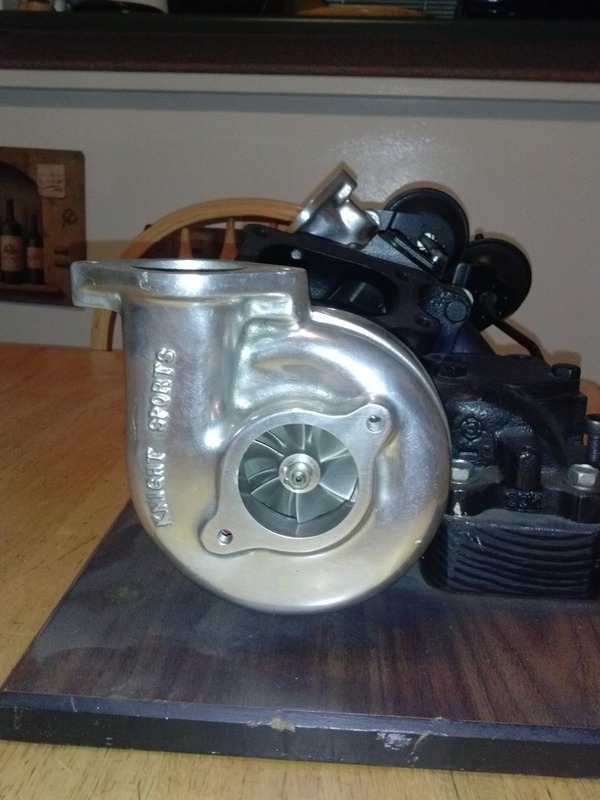 Hello, I have a used Knight Sports twin turbo setup for sale. 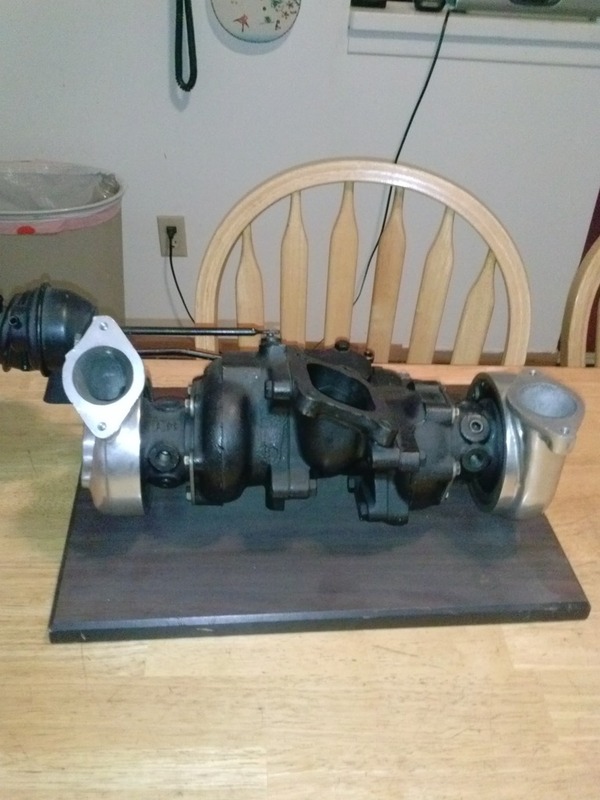 It is for an FD RX-7. 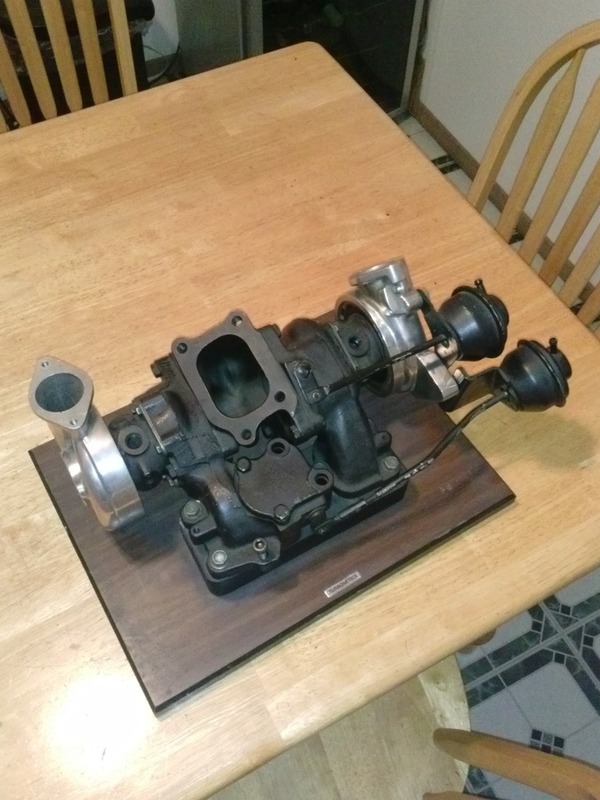 I work at Turbonetics and they were using it as a centerpiece, as you can tell by it being bolted to a wooden base/plaque. 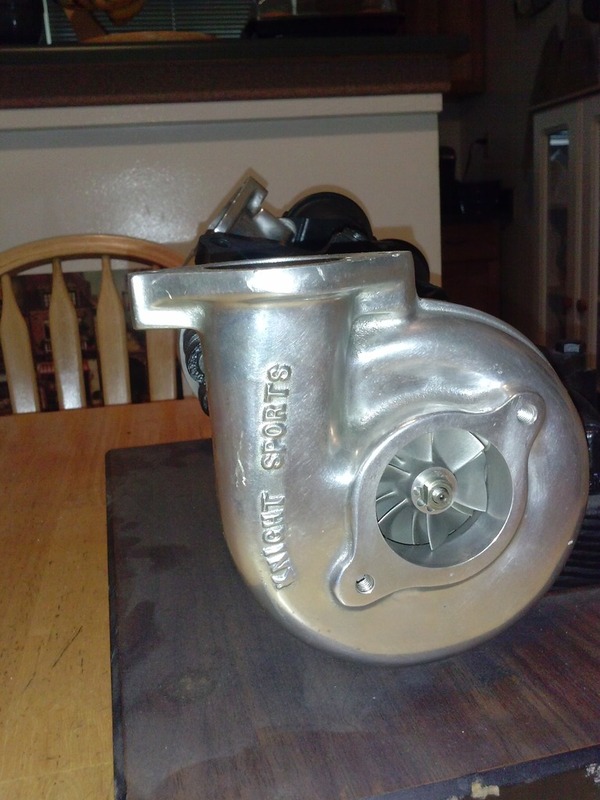 It was on a customer's car awhile back, and was removed only due to the customer wanting to go to a single turbo setup. The setup was working perfectly when removed. It has sat on a table in it's present condition since then. It is in great condition. Both compressor wheels and turbine wheels are in perfect condition, with no bent, broken, or damaged fins. Both compressor housings and turbine housings are also in great condition. There are no scrapes, rubs, or any sign of wheel to housing contact. There is very minimal lateral or horizontal play in the wheels, and you could probably run as is without issue. But I would probably recommend rebuilding them, if only for piece of mind. From what I can tell, they could probably support up to 500whp with proper supporting mods, but not much more. Now, they seem to be quite rare, and I can't find much other information on them. Some of you might know more about them. 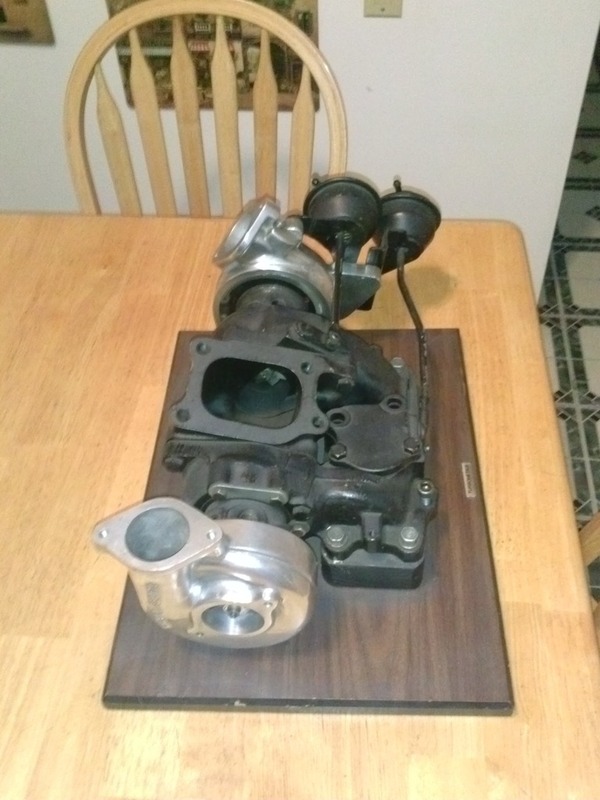 I do not have any other pieces or parts, other then what you see in the pictures. Located in Los Angeles, CA and I am asking $1050 shipped OBO for them. Thank you! Price is negotiable. 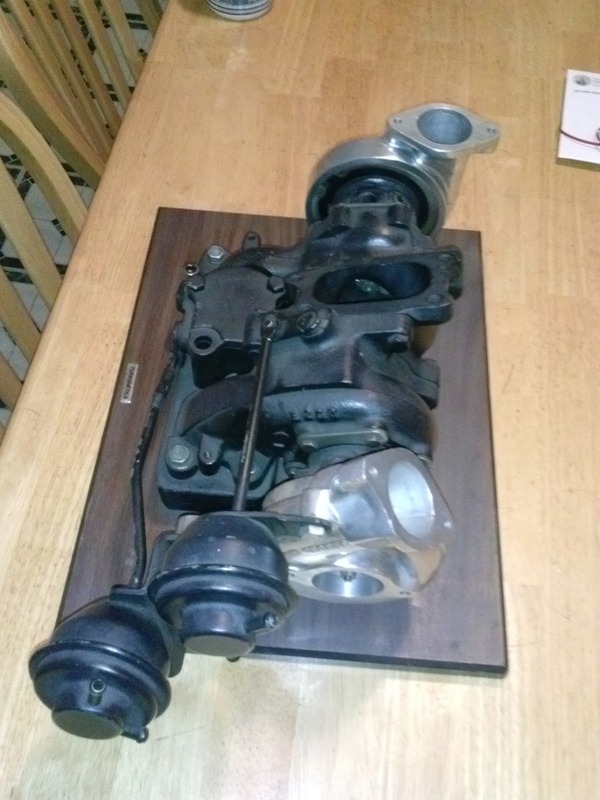 Need to get these into the hands of a rotary owner, instead of sitting pretty on my coffee table. Need these gone. Again, price is negotiable within reason. Really? Nobody is interested in these? I have them for $1050 shipped anywhere in the US. But I am also open to reasonable offers. I'm looking to replace my twins since they are starting to fail. What kind of deal can you swing to unload these?